^ "James Brady's death ruled a homicide, police say". CNN.com. August 9, 2014. Retrieved April 2, 2015. ^ Hermann, Peter (August 8, 2014). "Medical examiner rules James Brady's death a homicide". Washingtonpost.com. Retrieved April 2, 2015. ^ "James Brady's Death Was a Homicide, Medical Examiner Rules". NBCWashington.com. Retrieved April 2, 2015. ^ Corasaniti, Nick (August 8, 2014). 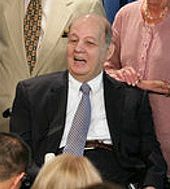 "Coroner Is Said to Rule James Brady's Death a Homicide, 33 Years After a Shooting". The New York Times. Retrieved January 2, 2015. ^ Hermann, Peter; Ruane, Michael E. (August 8, 2014). "Medical examiner rules James Brady's death a homicide". The Washington Post. Retrieved January 2, 2015. ^ Hermann, Peter (January 2, 2015). "Hinckley won't face murder charge in death of James Brady, prosecutors say". The Washington Post. Retrieved January 2, 2015. ^ a b "John Hinckley, Jr. – Reagan – WGBH American Experience". PBS.org. Retrieved April 2, 2015. ^ a b c d e f g h "Ronald Reagan ... Assassination Attempt". reagan.com. Archived from the original on April 28, 2009. Retrieved April 2, 2015. ^ a b "Once again, the question is 'How?'". The Milwaukee Journal. Associated Press and United Press International. March 31, 1981. Retrieved July 22, 2012. ^ a b c d e f g Office of Inspection. "Reagan Assassination Attempt Interview Reports" (PDF). United States Secret Service. Archived from the original (PDF) on July 21, 2011. Retrieved March 11, 2011. ^ Raines, Howell (March 31, 1981). "Reagan Wounded In Chest By Gunman; Outlook 'Good' After 2-Hour Surgery; Aide And 2 Guards Shot; Suspect Held". The New York Times. p. A1. Retrieved December 2, 2018. ^ a b c d e f "CNN Transcript – Larry King Live: Remembering the Assassination Attempt on Ronald Reagan". Transcripts.cnn.com. March 30, 2001. Retrieved April 2, 2015. ^ a b c d e f g h "Health and Medical History of President Ronald Reagan: Chronology of the Shooting". Doctorzebra.com. Retrieved April 2, 2015. ^ a b c d e f g h i j k l m n o Peppard, Alan (May 13, 2015). "Tested Under Fire: How George H.W. Bush asserted control in the wake of the Reagan assassination attempt". The Dallas Morning News. Retrieved December 1, 2018. ^ a b c d e Wilber, Del Quentin (March 29, 2012). "Long-sought message on day Reagan was shot finally emerges". The Washington Post. Retrieved December 2, 2018. ^ a b "Bush Relieves Haig as Interim Crisis Manager". The Palm Beach Post. March 31, 1981. pp. A8. Retrieved May 1, 2013. ^ "Morning Edition – Reagan Tapes". Npr.org. Retrieved April 2, 2015. ^ "Media Outlets Apologize After Falsely Reporting Giffords' Death". The Huffington Post. Retrieved December 3, 2015. ^ "Brady Campaign to Prevent Gun Violence". Bradycampaign.org. August 10, 1999. Retrieved April 2, 2015. ^ "Brady's death ruled homicide; police investigating". Usatoday.com. August 9, 2014. Retrieved April 2, 2015. ^ "Hinckley Tests Expanding Freedom in Virginia". NBC4 Washington. Retrieved January 5, 2017. ^ Hermann, Peter (February 19, 2015). "John Hinckley won't face murder charge in death of James Brady, prosecutors say". Washingtonpost.com. Retrieved April 2, 2015. ^ "Jodie Foster, Reluctant Star". Cbsnews.com. December 7, 1999. Retrieved April 2, 2015. ^ "Without Warning: The James Brady Story". (IMDb) Internet Movie Database. 1991. Retrieved June 21, 2012. ^ Fries, Laura (December 5, 2001). "Review: 'The Day Reagan Was Shot'". Variety (magazine). Retrieved September 4, 2017. ^ de Moraes, Lisa (May 23, 2016). "Kyle More Cast As John Hinckley Jr. In Adaptation Of Bill O'Reilly's 'Killing Reagan' For NatGeo". Deadline Hollywood. Retrieved September 12, 2017.